Weak tropical storm Don is badly sheared and is a minimal tropical storm. It is moving steadily west northwest toward the south Texas coast. A burst of deep convection has recently built over the center of circulation which may allow it to strengthen some. The strong shear environment should continue to disturb the circulation, so only beneficial rain will impact Texas with a minor storm surge. As of 7 am cdt Arlene was centered at 24.0 N / 89.8 W or about 495 miles ese of Brownsville, Texas / 545 ese of Corpus Christi, Texas. It was moving wnw at about 10 mph. Top sustained winds estimated at 40 mph ( 40 mph NHC advisory). Pressure was estimated at 1000 mb. Forecast models steer Don around a higher pressure areas toward south Texas by Saturday. Quick changes in intensity are possible since it is a small system. Don is stilled being sheared, but has strengthened some overnight. The center of circulation is on the top side of the thunderstorm cloud mass. This means that the heaviest of the rains will impact extreme south Texas into northeastern Mexico. It appears that heavy rain will be the greatest impact from Don with over 5" possible. Don will make landfall near or just north of Brownsville late this evening. 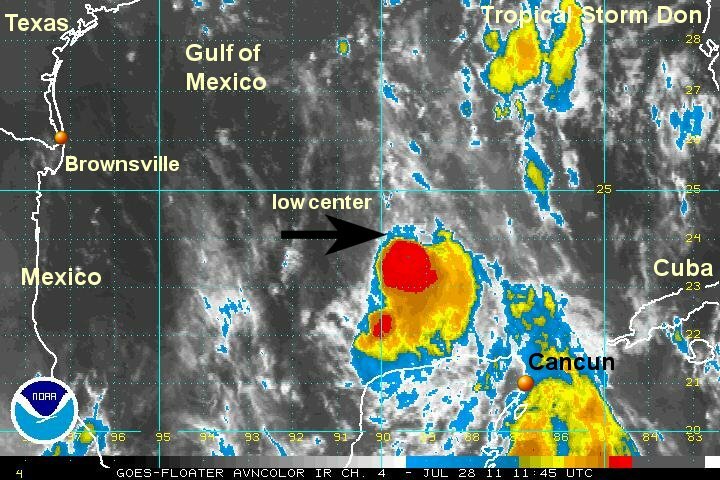 As of 7 am cdt Don was centered at 25.7 N / 94.3 W or about 195 miles east of Brownsville, Texas / 255 se of Corpus Christi, Texas. It was moving wnw at about 14 mph. Top sustained winds estimated at 50 mph ( 50 mph NHC advisory). Pressure was estimated at 1000 mb. As expected, Don came ashore last evening. The center of circulation was ill defined. Top rainfall amounts were isolated at 3" as estimated by doppler radar. 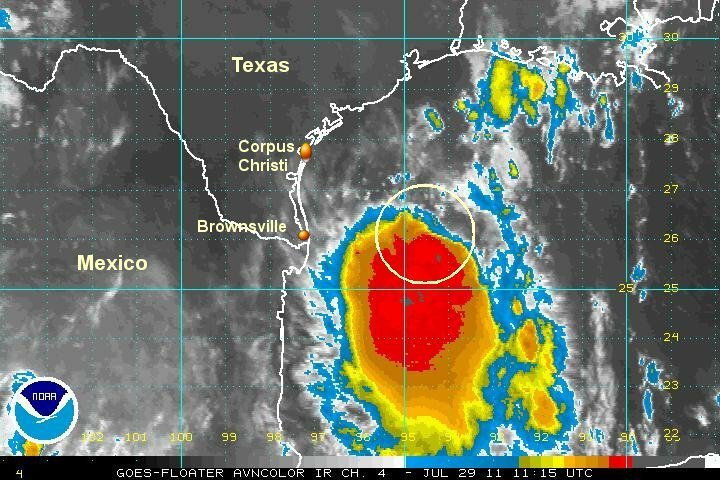 Estimates approached 9 inches east of Brownsville offshore. Browsnville reported .63" of rainfall with winds of only 10-15 mph. In summary, the circulation weakened as it approached the coast and the only effects were isolated heavy rainfall. 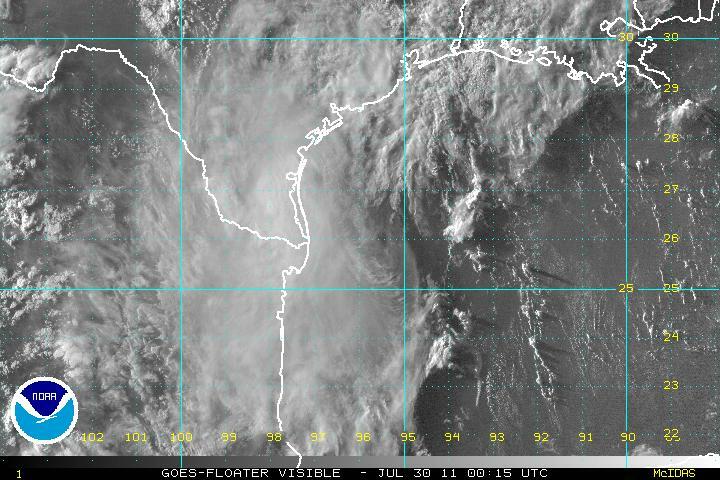 Tropicast: Visible Floater Satellite - Don before "landfall"